Making Memory Quilts With Large Pieces. 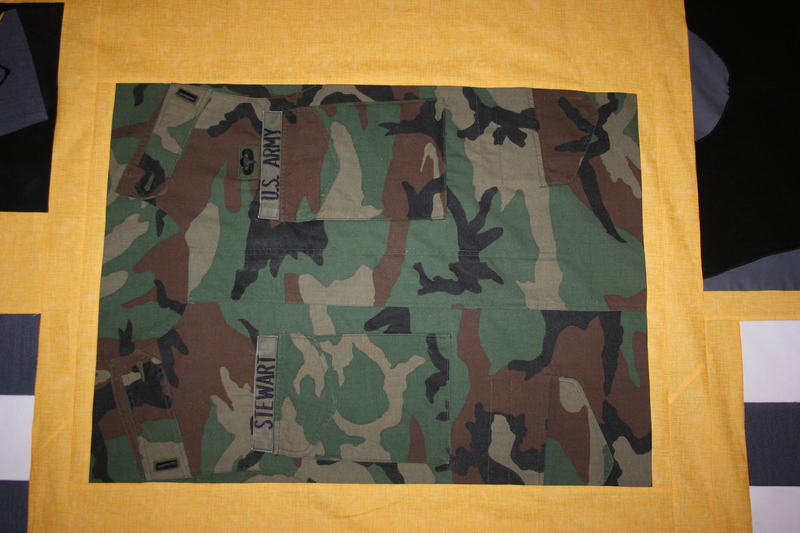 Over the last months I have been working on a memory quilt for a client that contains West Point and Regular Army uniforms. I decided to keep the uniforms intact as much as possible so you can see what they looked like. This is the heavy black parka. I removed the hood and the sleeves and took out the zipper and pockets. The is the dress gray coat that I removed the sleeves and zipper. I kept the collar intact – just debulked it. I took one of the sleeves from the dress gray and made a block out of it. This is the summer India uniform. As with the dress gray I removed the sleeves and debulked the collar. 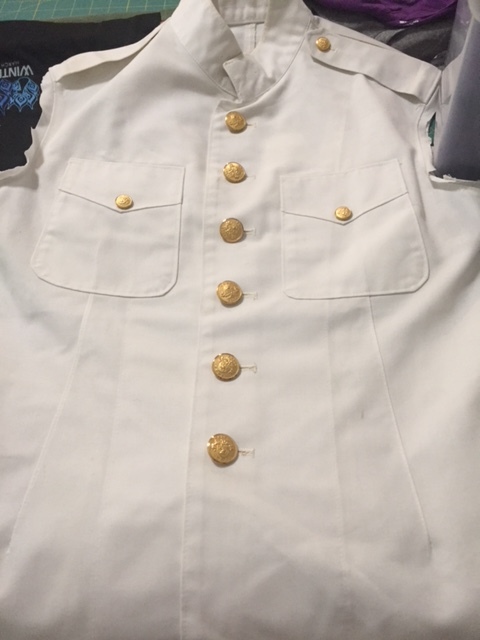 I also removed all the buttons and stitched down the epaulets. The full dress uniform I removed the sleeves and kept both of them for blocks. 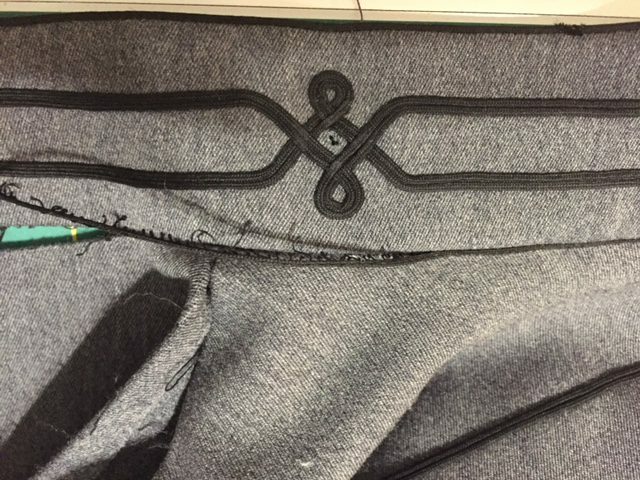 I debulked the collar as shown in previous post. 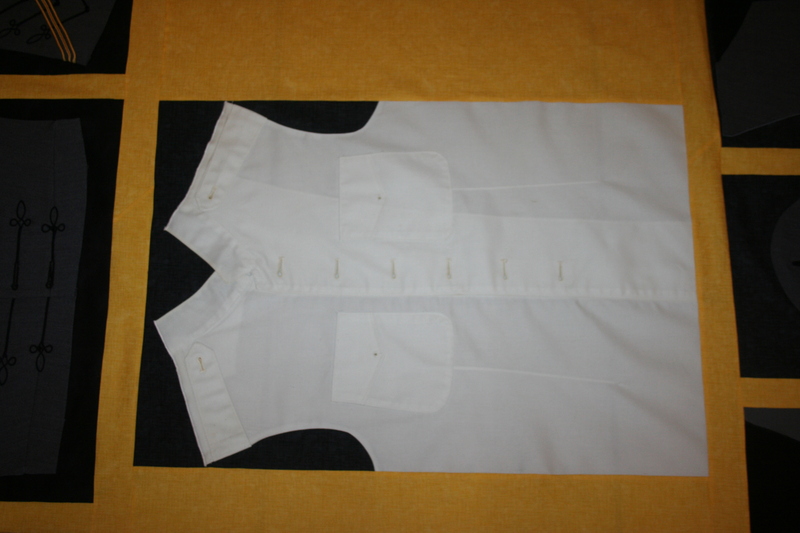 The dress gray sleeves were attached without the gold rank as it is too thick to quilt through. 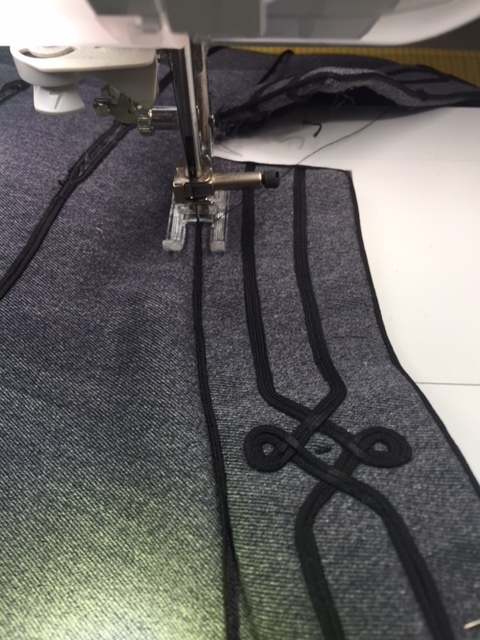 They will be added via hand stitching after the quilting is done. There were two Army BDU’s, one a shirt and one a jacket. 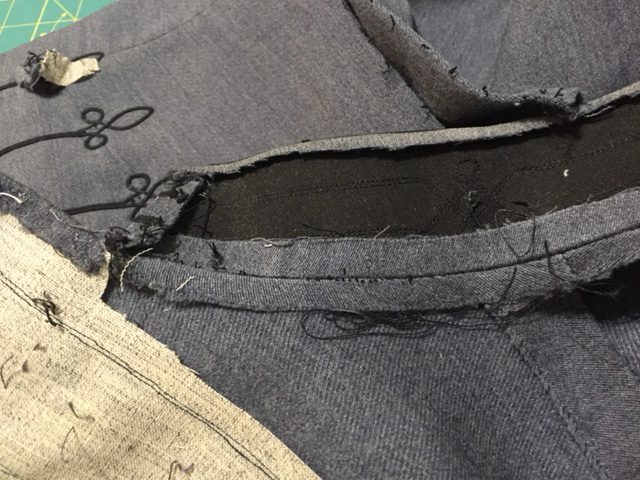 I used both of them, removing sleeves and stitching down pockets. I choose not to remove these patches but to quilt around them. You may want to remove them, do the quilting and then sew them back on afterwards. I was given a pair of pants from the India uniform and the Dress Gray. I cut them up and made two of this block set. This is the quilt top put together and ready to quilt!! This kind of quilt shows how you don’t have to cut everything up into pieces. You can keep things whole, just like you do in other memory quilts. Spread your wings and try different things. It makes for very special and individual quilts. Hope you all had a great and safe 4th of July. We spent the day and night with friends in St. Augustine. It was great and the fireworks downtown were wonderful. I have been busy on two quilts. One is a baby quilt for a friends granddaughter. They like butterflies and I found a really cute fabric by Susybee for Hamil Textiles. 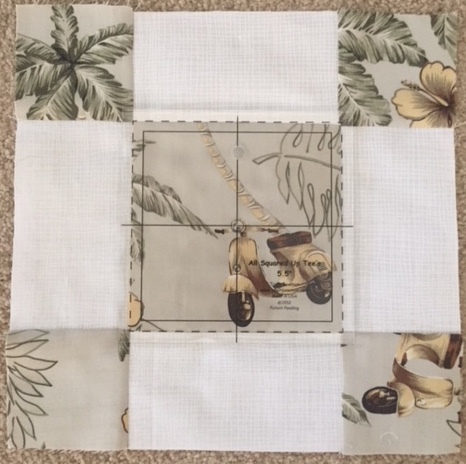 I designed a simple quilt that would accentuate the fabric but also have a little whimsy to it with a pin wheel block. I gave the client the choice between having all the pin wheels the same color and they would pick the color or mixing it up. She chose mixing up the pin wheels. I am so glad they did, I love all the different colors. I picked a dark and a light of each color on the quilt and then mixed them up in the quilt. The mom doesn’t like purple but likes turquoise so I made sure the purple/blue color in the quilt went more to the blue in the pin wheels and made the inner border turquoise. I love working with my clients to give them the quilts they want for their loved ones. Most of my quilts are memory quilts but sometimes I get to make quilts that will be the foundation of many memories to come. Those are really special too. Are you working on anything this summer or are you taking a break? I love seeing all the things people do so please share your projects with us so we can be inspired. We had a wonderful few weeks of celebrating our son’s wedding and our 40th anniversary and now I am getting back into work again. 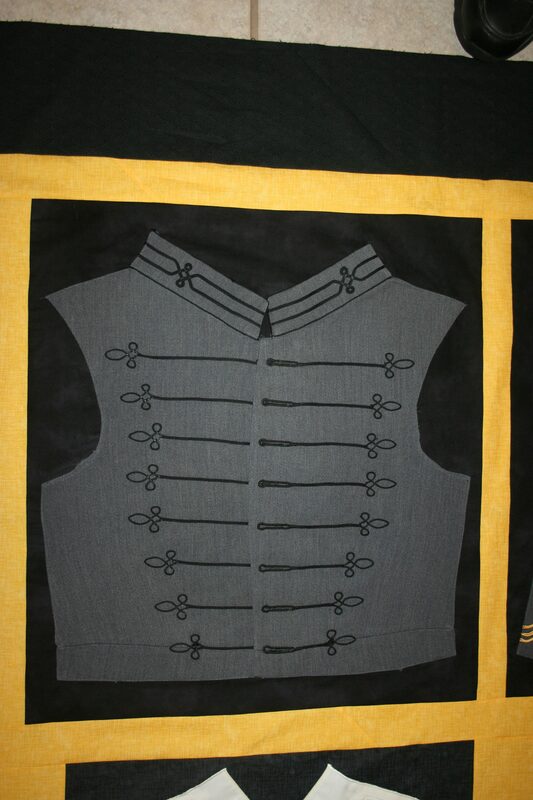 I have been working on a quilt using West Point Uniforms. No matter how many of these I do it still amazes me how many layers of stabilizer are used in these things. 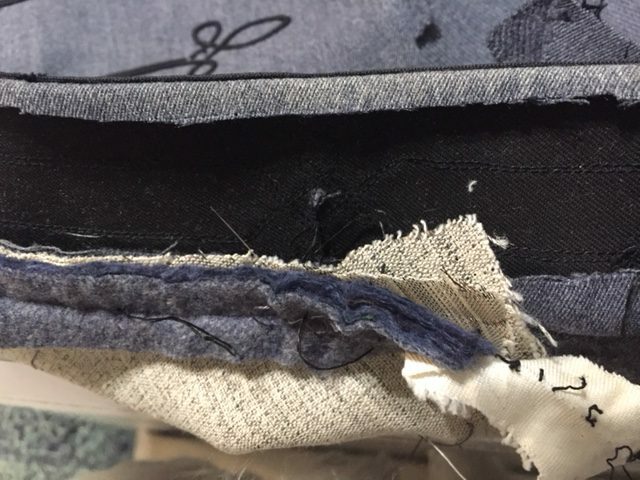 I wanted to show you how I did the collar so you see how you sometimes have to take things apart to debulk them and then sew them back together. This is the collar before debulking. After I have removed the facing fabric you can see there are four layers of stabilizer in this collar several of them are fairly thick. It is no wonder it stands up so stiff and straight. In this instance when I took out the stitching that was holding down the stabilizer I also was undoing the black cording that decorates the lower front of the collar. When these kinds of things occur I make sure I take good pictures as I go so I can put the item back together again looking the way it is suppose to. This is the collar minus all the extra layers. This is the front of the collar showing the cording now loose. When you get the collar placed the way you want and resewn you can then reapply the black cording the way it is suppose to be. 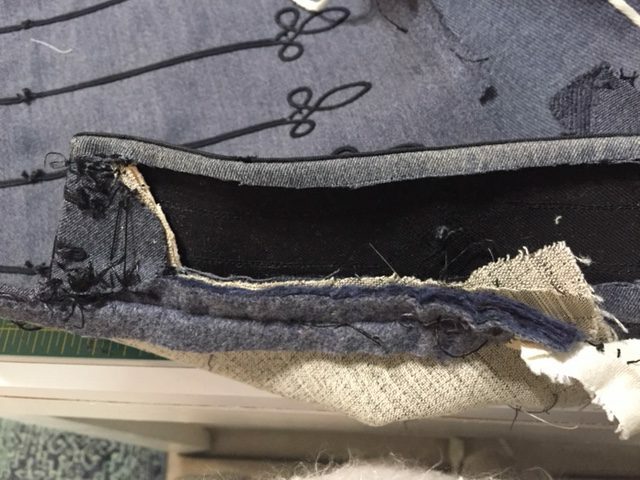 You can see that I use my open toe foot so I can see the cording and needle really well to sew it on. Don’t be afraid to take a lot of pictures as you are taking things apart so that you will have an easier time putting them back together again. I would rather delete photos not used than to waste time trying to remember and figure out how something had been before ripping it apart. Hope this gives you some more “behind the scenes” information on how I do things and makes it easier for you to do your quilts. Take care and have a wonderful, safe 4th of July weekend. This is a crazy time of year with all the end of school functions, graduations, and vacations. This last few weeks I have been finishing quilts for clients before we head north to Syracuse and Utica, New York for our son’s wedding next week. We are so excited and are busy getting all our stuff together for the trip and the big day. I thought since I had shown you how i fussy cut some of the blocks for my clients quilts that I would show you the end product. The clothes I was given were from the clients Mom and Dad so there were an equal amount of bright colors and bold patterns from Mom to offset the more subdued colors and patterns of Dad. 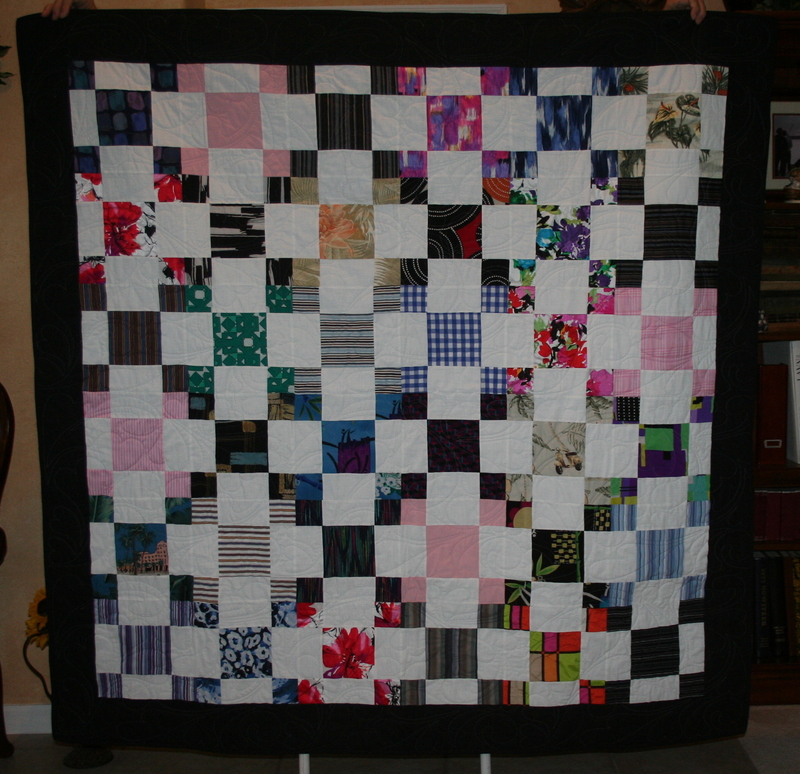 The end result made for a really colorful scrappy quilt. Hope you are enjoying all the end of school activities and have some really neat things planned for the summer. I know I do. 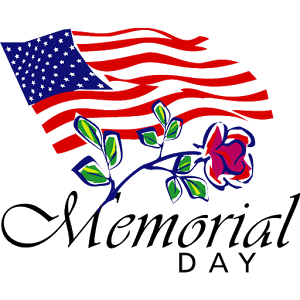 On this Memorial Day weekend I would like to say thank you to all the men and women of our armed forces and their Gold Star families who have made the ultimate sacrifice for their country. Without their selfless acts we would not be enjoying the freedoms we have. As you are off having fun at the beach, lakes and parks please do not take those freedoms for granted, someone gave their life and someone lost a loved one to give them to you. God Bless Our Military and their Families Now and Always. 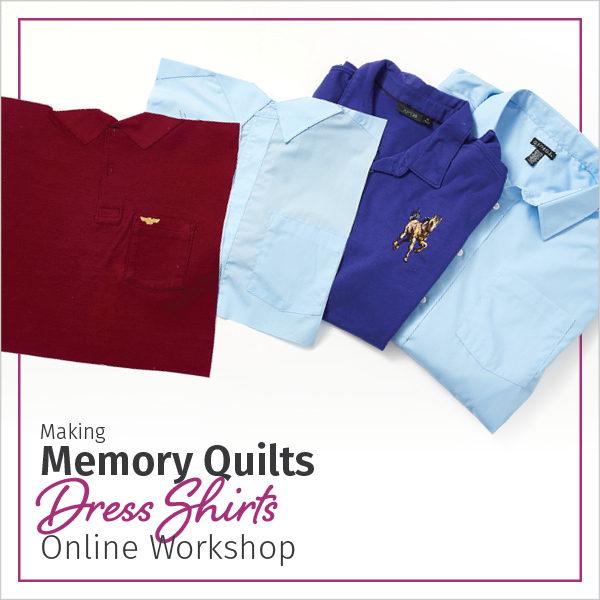 Memory Quilting Online Classes Available!!!! Memory Quilting is so much more than t-shirts. 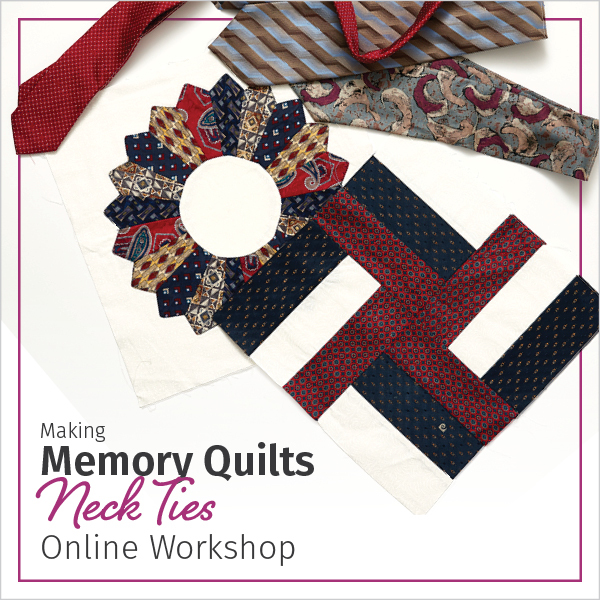 I am so happy and proud to announce that my online Memory Quilting Series of classes with The Quilting Company are now available online. These classes, five in total, are geared toward your specific memory quilting needs. Are you making a quilt with Ties? Then check out my tie class. Have a pile of children’s clothes that you don’t know what to do with? Take my children’s clothes class. There is something for everyone. 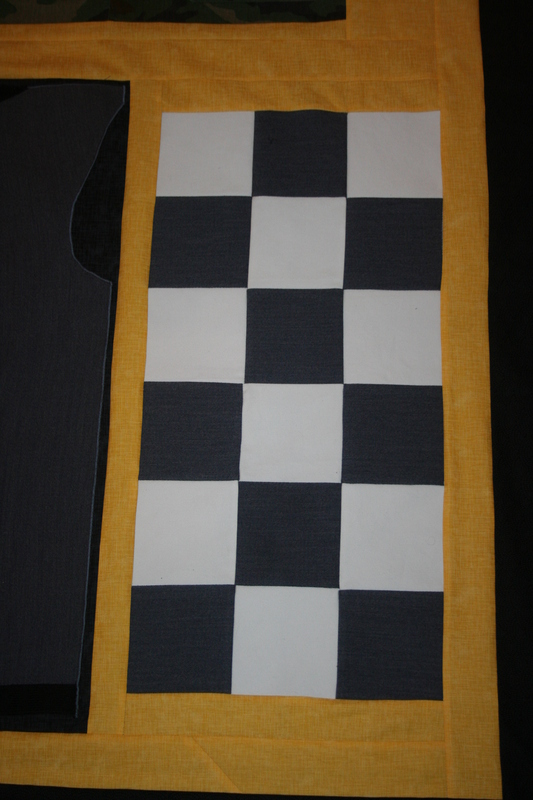 In each class you will learn the techniques and supplies you need to take your clothes items and make them into quilts. I will explain how to make decisions on what will work and what won’t in your quilts. 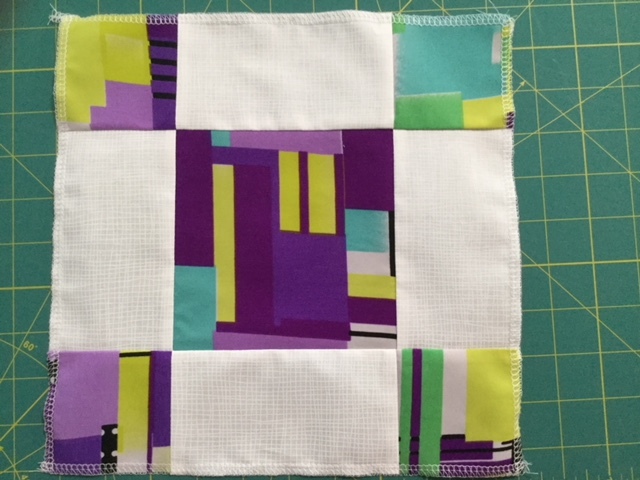 I will discuss what stabilizers are best and give you lots of other tips to help make creating your quilts a breeze. 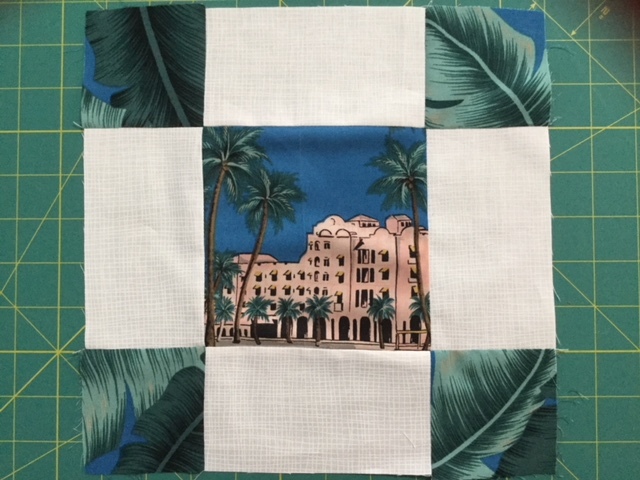 Go to The Quilting Company at www.quiltingcompany.com and look for the following class covers to find your way into the wonderful world of memory quilting. 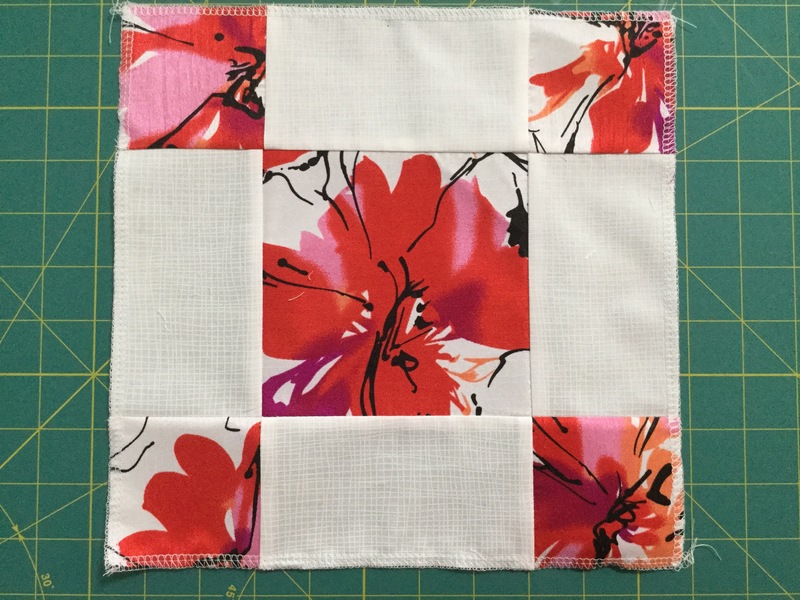 Check out all my classes for lots of techniques and tips on all the things you can do to make your memory quilts extra special. If you have any questions about the classes feel free to contact me here or via email at quilter@happymemoriesquilts.com. 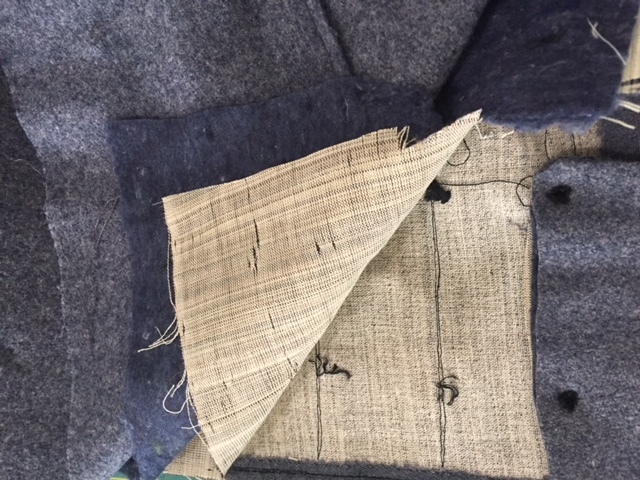 I am working on a project for a client that is a combination of the Mom’s/Grandma’s and Dad’s/Grandpa’s clothes. They want four quilts that are the same design and they wanted squares as that is what Mom/Grandma liked the best. I felt the squares needed to be big enough to show off the designs in the clothes. Many of the shirts had large patterns and some had only a few repeats in each shirt which made it a challenge to get four blocks out of them that were close to the same. 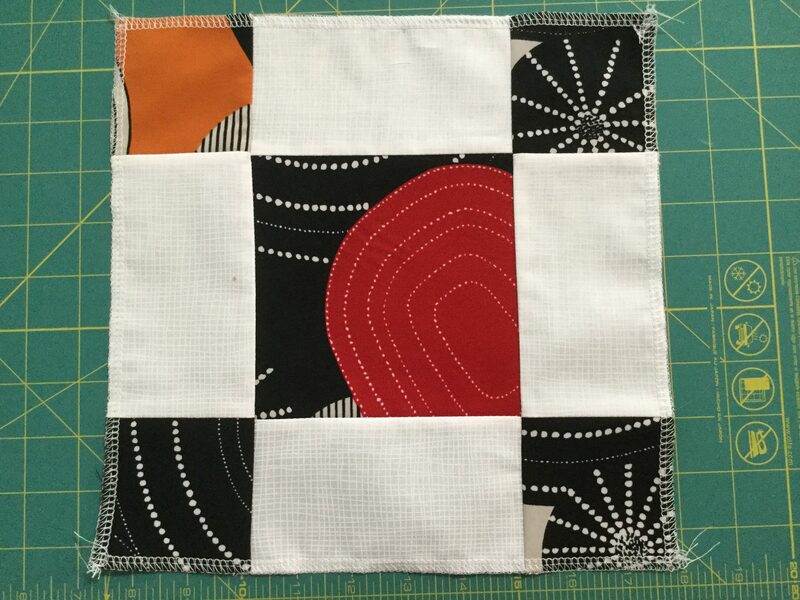 The block we decided on was a 10″ finished Uneven Nine Patch. 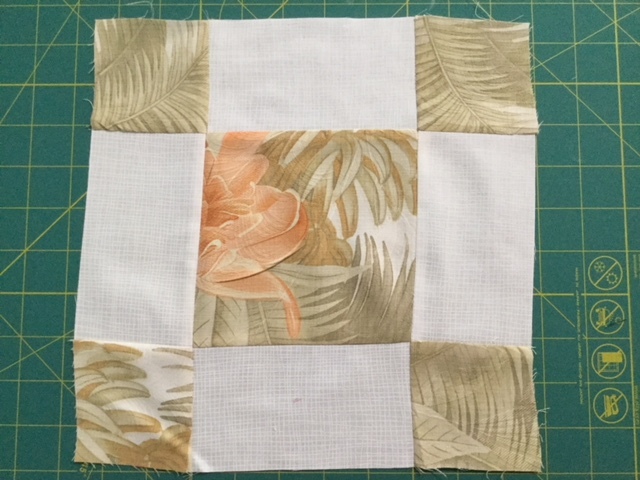 The center block was a 5 1/2″ cut which worked out perfect as I could use my 5 1/2″ All Squared Up Tee’s template to fussy cut the center blocks for the squares. When you are using clothes for quilts sometimes you can just cut them up just like you would regular fabric. I was able to do that with many of the shirts in this project but some of them needed special treatment. I am going to go through some of the blocks here for you to give you an idea of what my thought process was when I was cutting the blocks out. Since I was in design mode not teaching mode I didn’t think of taking pictures of the shirts before cutting so please forgive the lack of before and after photos. OOP’s :-). I am sure you will get the idea without them. 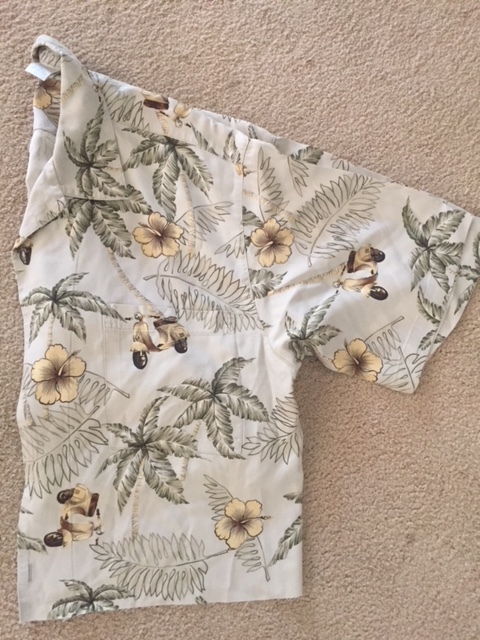 I had several men’s Hawaiian style shirts that had patterns with large elements that were spread out across the whole shirt. When you have a design like this you want to pick the element that will pop the memory of the shirt the most and use that in the block. In the case of the shirt below the little scooters were a focal point in the shirt so I needed to use them so the memory of the shirt would come forward when looking at the block. Using my 5 1/2″ Template I fussy cut 4 squares making sure the scooter was in the block. Below is the final block. Using the same 5 1/2″ template I cut the other shirts. For this one I made sure the flowers were in the center square and leaves and part of the volcano were in the corner blocks. This shirt had a row of the pink building across the front and back. Using the template I was able to cut 4 different portions of the building so it was included in all the center blocks. I cut the leaves that were on the rest of the shirt to make the four corner blocks. On these next blocks I made sure that each block included a portion of the overall design. I tried to make sure the center block was a major design that reflected the shirt. The corners took in any other portions of the shirt I felt needed to be included to reflect the whole shirt design such as design elements or other colors. The shirt cut for the block below was mostly the geometric black but it had large pops of the red with some orange. For this block I made sure I got the red in the large block and then made sure each 10″ block also got a pop of the orange in it to reflect the overall design of the shirt. The shirt that gave us the block below had all the different purples as well as the lime green and blues. I made sure when I cut the pieces for the blocks that it represented all the different colors in the shirt. 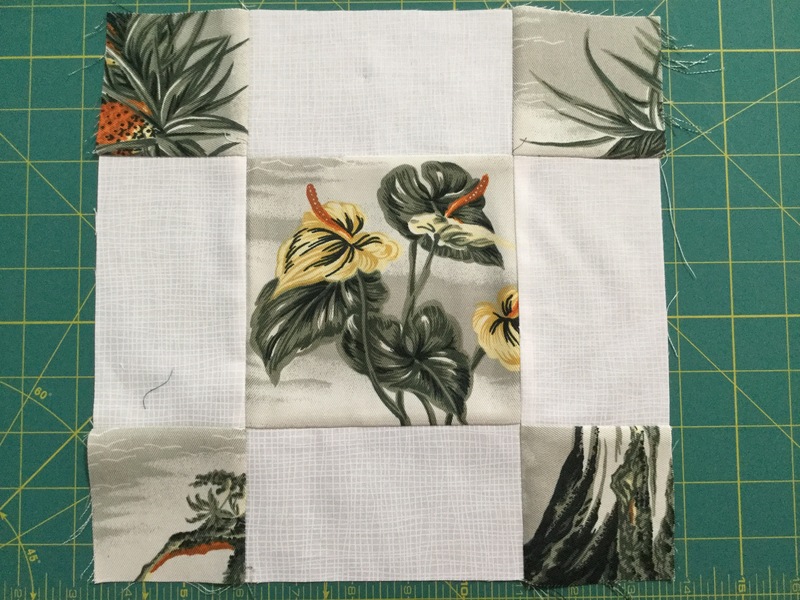 When designing quilt blocks using all these different designs it just takes a little bit of thought to make a quilt that will bring back all the fond memories your clients have of the person wearing them. When they see the quilt block they don’t just see the block but a picture of their loved one wearing the item. This technique can be used with any item such as dresses, skirts, coats etc. Don’t forget to pull out my small All Squared Up Tee’s Templates for these projects. They really make fussy cutting the blocks a breeze. Hope this finds all going well for all of you. I have been doing well getting into Pilates classes and working on stuff around the house. The weather here has been gorgeous. We finally got a real spring, which we haven’t had in several years. 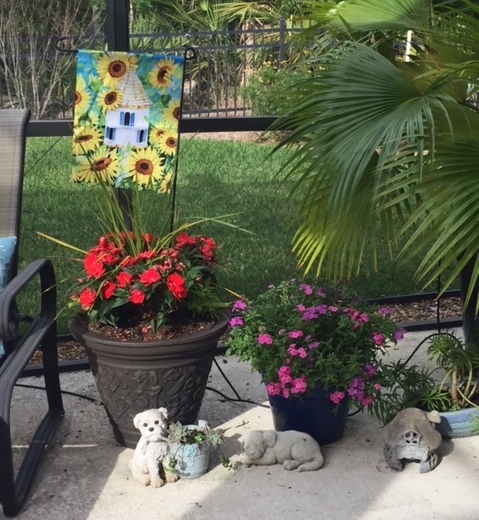 We spent late last week and weekend doing spring-cleaning and planting of flowers on our lani. It is so nice to have everything clean and fresh again with flowers spilling over pots. 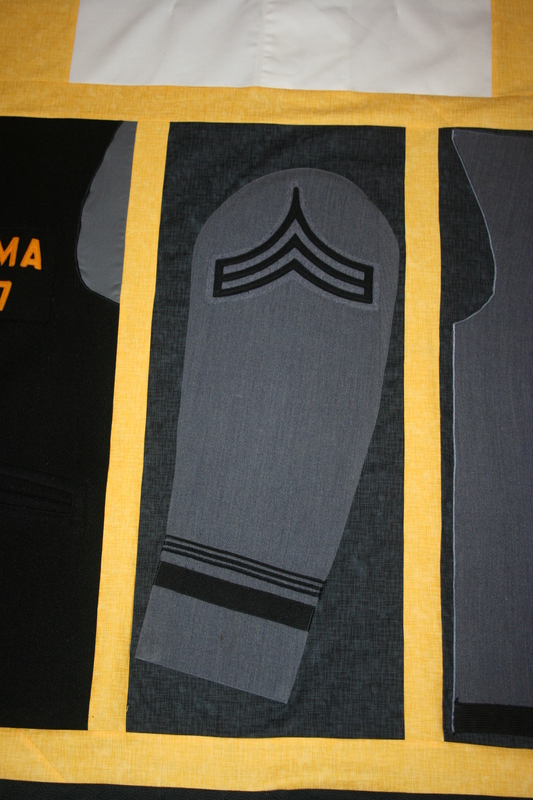 On the work front I have started a new quilt for a West Point graduate. 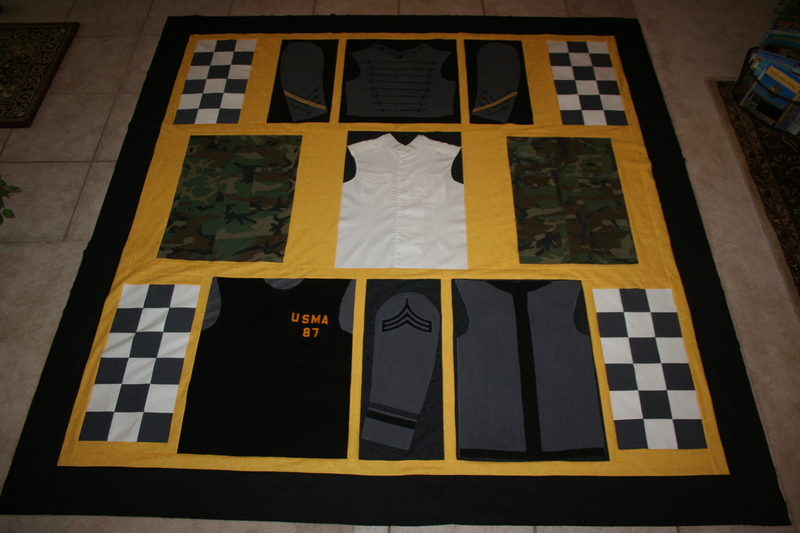 I have done quilts with these uniforms before, including one for my hubby, but this time I am keeping all the uniforms together and making the blocks out of the full fronts, including collars. I certainly like to challenge myself. J I have been taking the uniforms apart this week and it amazes me what all goes into the uniforms they make for the cadets. My husband, who is a graduate, made the comment that it is no wonder they weighed a ton with all the layers they have in them. These are just a few examples of the challenges memory quilting can give you. Every quilt and every item that goes in them has the potential to pull you outside your comfort zone. 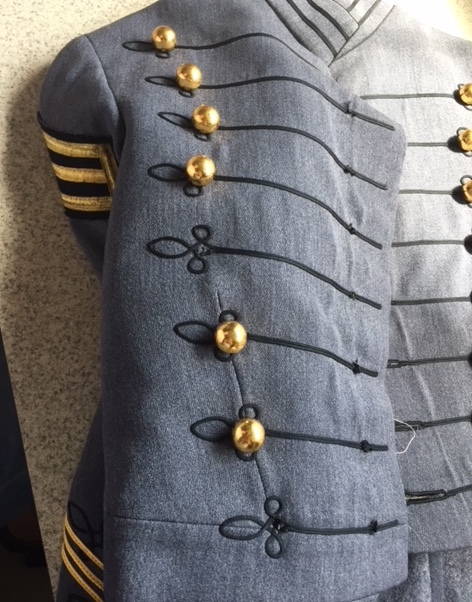 I normally practice on similar items, and highly recommend it to my students and customers, but I really don’t want to practice on my husband’s uniform and there aren’t any in the local thrift shop so what do you do? In a case like this I wing it. I know that sounds scary, but if you take it slowly one step at a time you can do this. I take pictures and notes as I take things apart so if I need to put something back together I can. 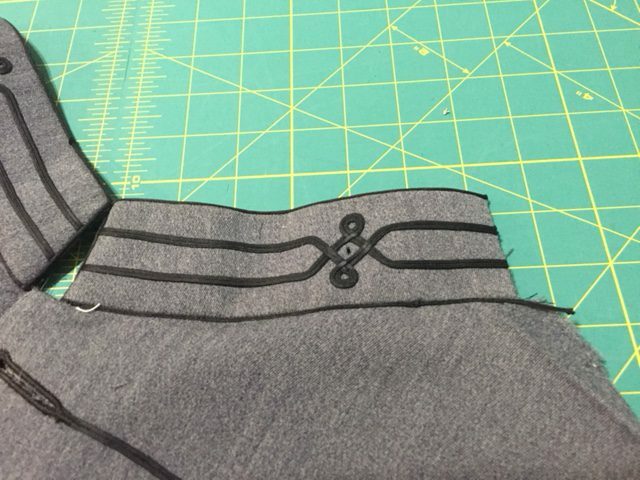 I seam rip as many seams as possible and not cut so this is possible. This is definitely a quilt that will have to be specialty quilted. There are always ways to get around clothes “problems” and put them in your quilts. 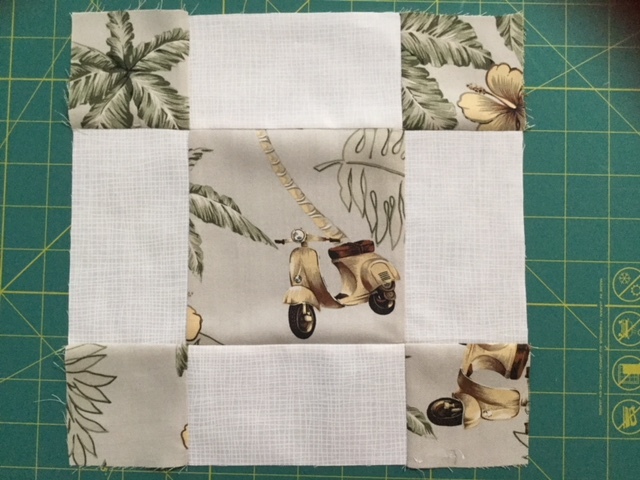 You just need to be willing to take your time, make a few compromises, and be willing to do some special quilting to make it all work. Hope this inspires you to think outside your box when designing your next memory quilt. The last few weeks have been crazy but so neat. 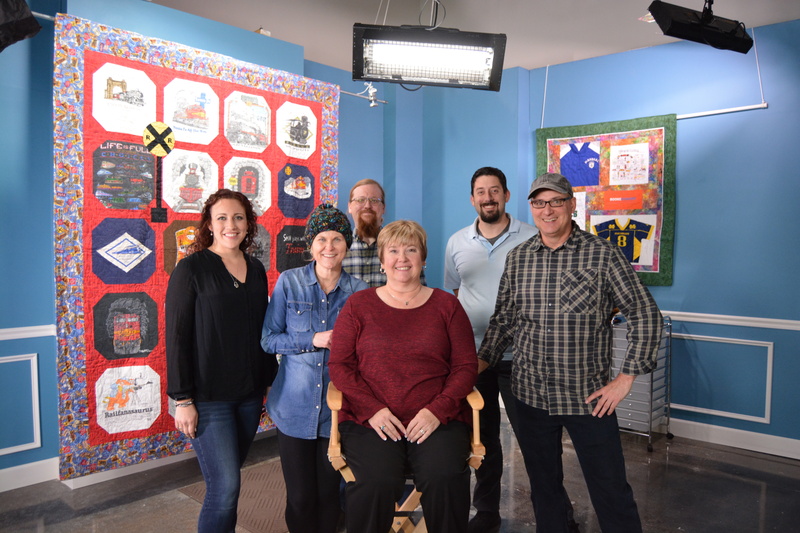 I went a week ago to Golden, Colorado to the offices of F&W Media to tape five Memory Quilting online classes for The Quilt Company. The crew that did the taping was just wonderful. They all worked together so well and made me so relaxed that I ended up enjoying the process instead of being intimidated by the camera. Sabrina, Ginger, Andrew, ME, Corey and Jon. You don’t realize all that goes into one of these classes until you do one. It takes months of preparation organizing what you are going to teach, getting all the step outs together, and making sure each lesson fits into the time you have allotted. I had requirements for taping such as the clothes I could wear, including colors. Nails, of course, had to be manicured. The taping started everyday at 7 am with me coming in for hair and makeup. For any of you who know me you know that in and of itself was a major accomplishment, I am not a morning person LOL. After Nikki was finished with me I started getting things together for the class we were taping that morning. 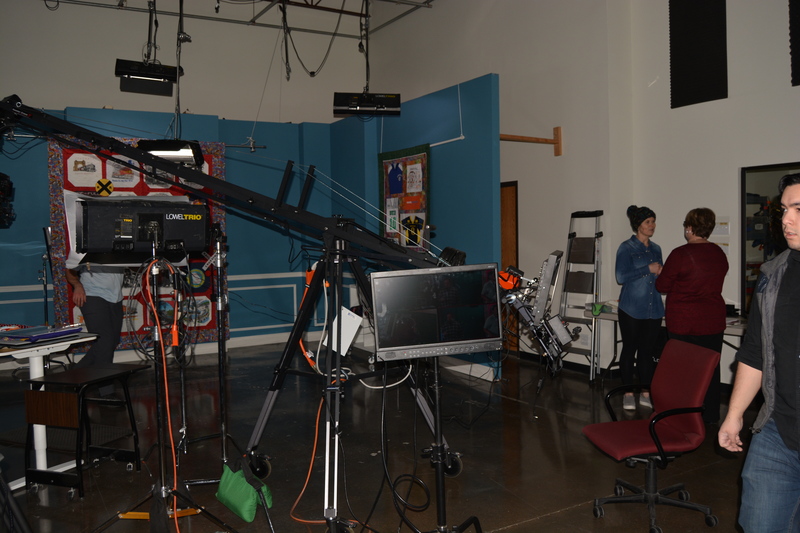 The crew would come in and get the cameras and lights together for the day. Corey always set me up with a mike and Jon, Ginger and Sabrina would go over with me what was going to be taped and how they were going to tape it. Jon was the Director and worked with Andrew & Corey running the cameras. It was so wonderful to work with people that respected each others opinions and ideas and genuinely seamed to enjoy working with each other. Speaking as “The Talent” they made the whole experience so much nicer and easier for me. We had a lunch break around noon and then went till 5:30 each night except for the last day Friday when we stopped at 3:30. I wanted to share some more photos with you so you could see the studio and more of the process involved. The young lady who made me look good for the camera every morning. Thank you Nikki! Here you can see the monitor/seating area for the boom camera that Andrew used. There were a few times it got really close to my head but he always warned me. LOL I am in the back right where I set up all my step outs for the days taping. This is Ginger, the producer, and I talking about the next segment. 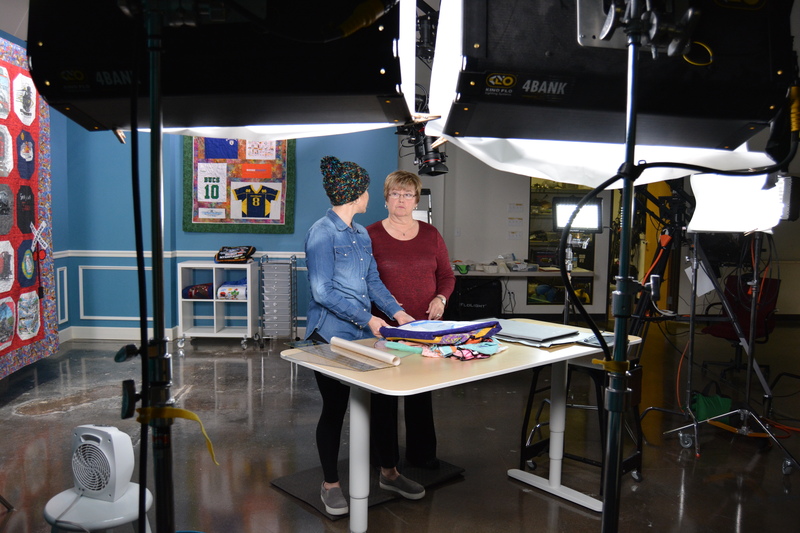 She and Sabrina, the Instructional Designer, were wonderful listening to what I wanted to teach and helping me to do it in the best way possible on camera. On the left forward you can see the white stool with a little heater on it, this was for the cold Floridian :-). We had lots of snow while I was there, about 10 inches total. Luckily I had a heavy winter coat. Even though the temperatures were in the single to low double digits most of the time Doug and I were there it was a dry cold, so we did pretty well dealing with it. You normally think of the lights during filming as creating heat but these are all LED’s so no heat was generated, therefore the little heater was put on off camera to keep me warm. Corey did a great job as sound/camera man shutting it off during taping when all of us forgot it was there. 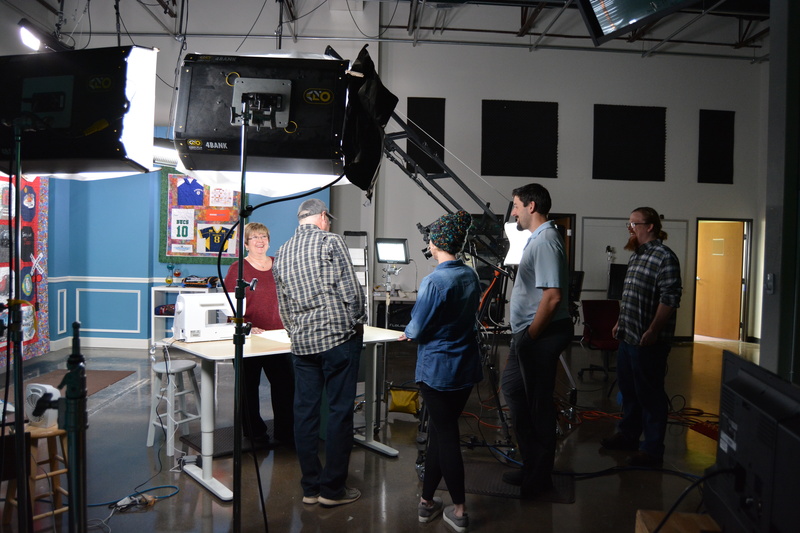 Jon, Ginger, and I setting the scene for the taping of the Children’s Clothing Class. You can see the boom camera in front of me and one of the other cameras to the left. The gang discussing the next step and having a good laugh. They kept it so light and fun everything went really smooth. 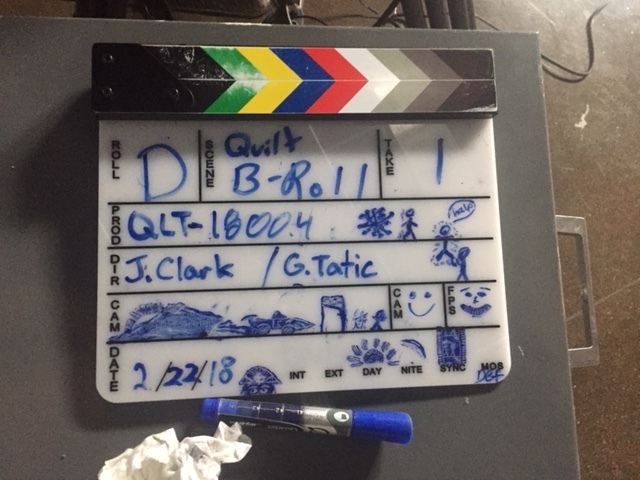 The Filmslate/Clapperboard used on the set. Me behind the table getting ready to tape. It was a great experience but exhausting. 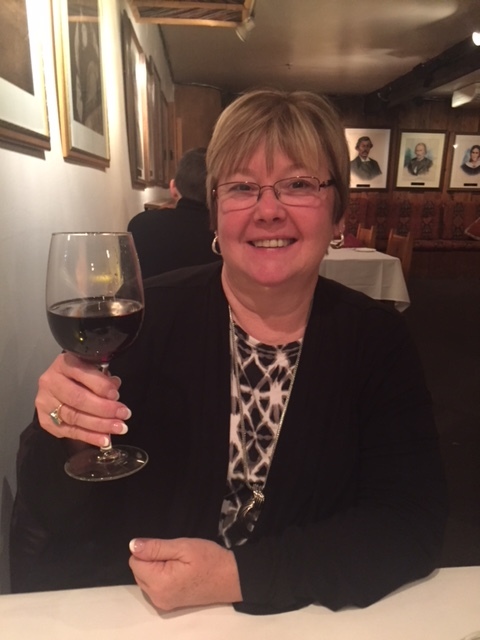 Friday night it was time for my hubby and I to celebrate a successful week with a great meal and a great bottle of wine at a wonderful restaurant called The Fort. The classes are slated to be put online in May. I will keep you posted as things move forward. In the meantime, if you have any questions or I can be of help with any of your projects don’t forget I am a phone call or email away. 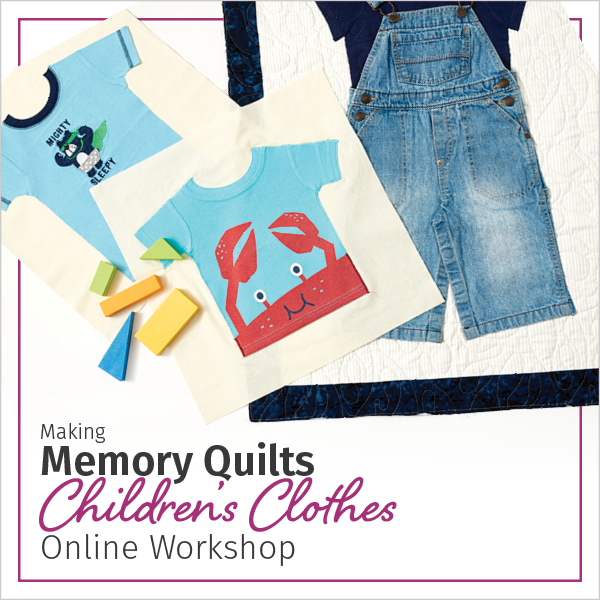 I am so excited to announce that I have been asked by the Quilting Company to work with them to create my memory quilting classes as online classes. 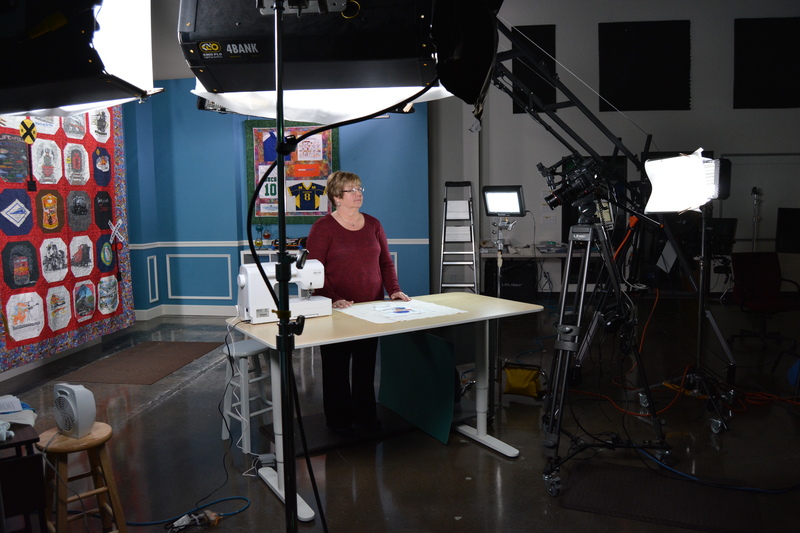 The Quilting Company has numerous classes available online. Their classes cover the entire spectrum of interests and techniques in quilting. 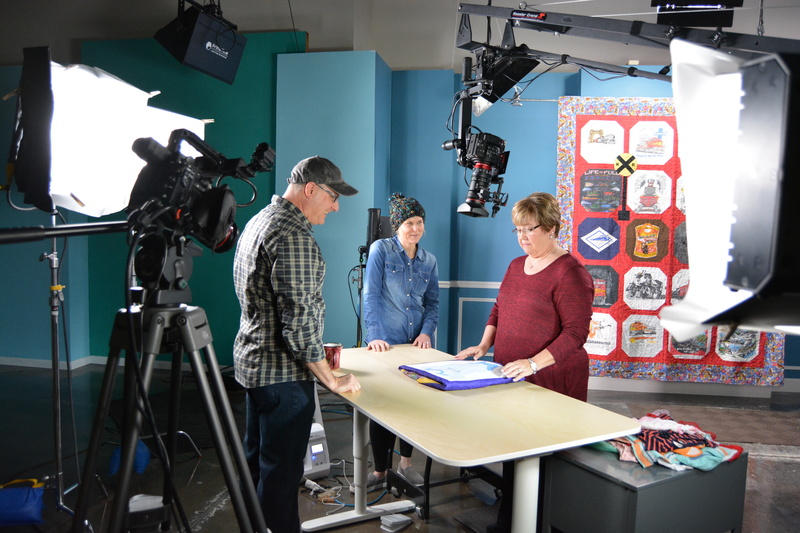 I will be taping 5 classes that will be available online for those interested in making their memory quilts extra special. 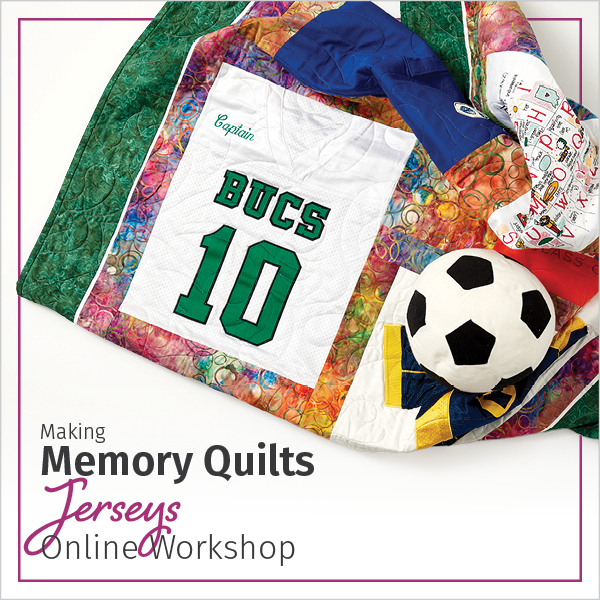 I will be teaching how to take T-shirts, Dress Shirts and Polo’s, Sports Jersey’s, Ties, and Children’s Clothes and make them into wonderful memory quilts for family, friends and clients. I have always done things a little differently, with that little extra, which many memory quilters don’t do. 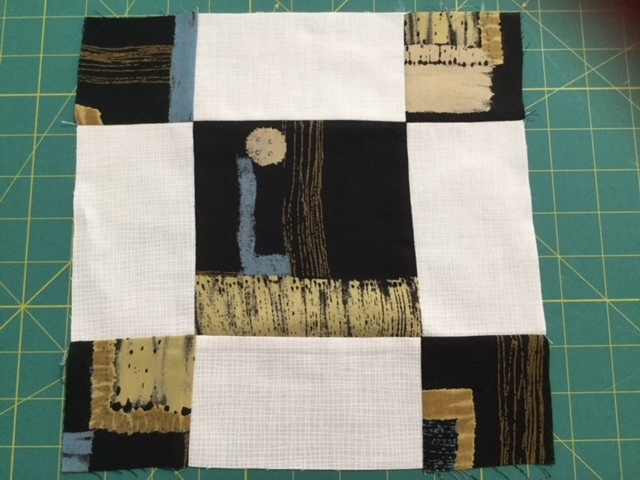 I am hoping these classes will allow anyone interested in making memory quilts beyond the norm to spread their wings and have fun with the process. 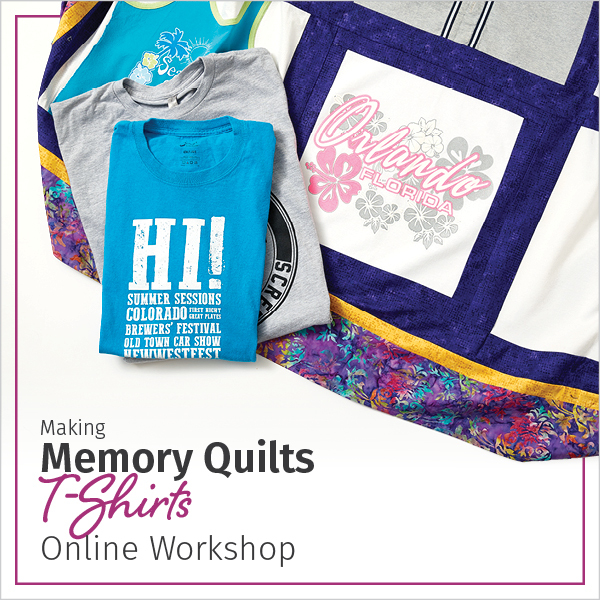 Memory Quilts including T-shirts are so much more than just cutting a square and I am excited to be able to share my expertise and ideas with a larger group of quilters. I head to Golden, Colorado in a week for the taping. It should be really interesting and fun. I promise to take lots of pictures and keep you posted on my adventure. Have a wonderful, productive weekend.